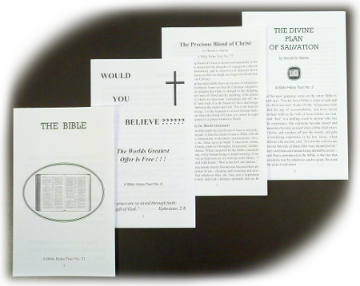 The ministry of Bible Helps, Inc. has been printing tracts and booklets in-house since 1978. We would be happy to help you with evangelistic and instructional material for you to hand out, and with Bible study material. There are more titles in print than are currently available on this site. Contact us if you are interested in receiving any printed materials. 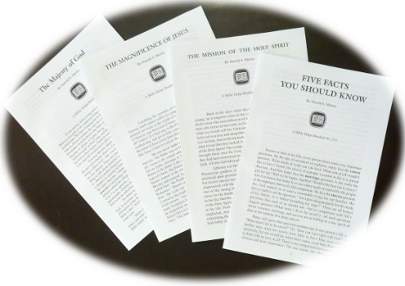 Our tracts are printed in a simple black-and-white format on good quality paper. Millions of these are sent out each year. Some are short with a simple and direct message of salvation, directed at evangelistic outreach; others are longer and provide instruction on various topics such as repentance, Christian love, and the home. Some titles have been translated into Spanish. These booklets are designed to present a message that is clear and concise, but more thorough than is possible with the tracts. Most are eight pages long. We publish a new title every other month, which is sent out on our mailing list. Contact us if you would like more information about joining this list.